Here’s a piece I started 2 years ago, entitled Painting with Andy Warhol. My vision 2 years ago was interpreting this “group portraiture”, inspired by the Dutch masters, as complete. But, I felt there was something missing and it went into hibernation. I have been playing with fabrics and recycled art. Texture intrigues me. I am getting ready for a show that requires big paintings. 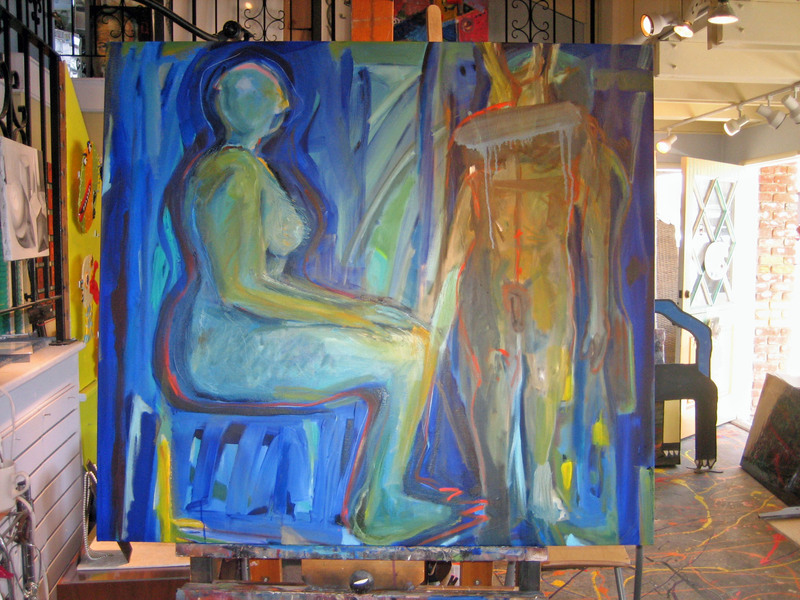 Being a true believer that art needs to offer a multi-level of interest, I often times pull out one of my “filed” works and use it as an under painting to re-develop it into its rich potential. That was my approach to this piece. One of my professors encouraged me to tackle the areas that I loved the most, as these were probably too strong and affecting other areas (cause and effect). I cut up other paintings and attached pieces in shapes to this one. Using oils, I have repainted over many areas also leaving some as they were. I’m quite satisfied with the new results. I rarely regret anything in my life, but I would have liked to have met Andy Warhol. By using some words of his name as “marks” on this canvas, I feel that I am painting with one of my mentors, and my painting becomes a tribute to him. 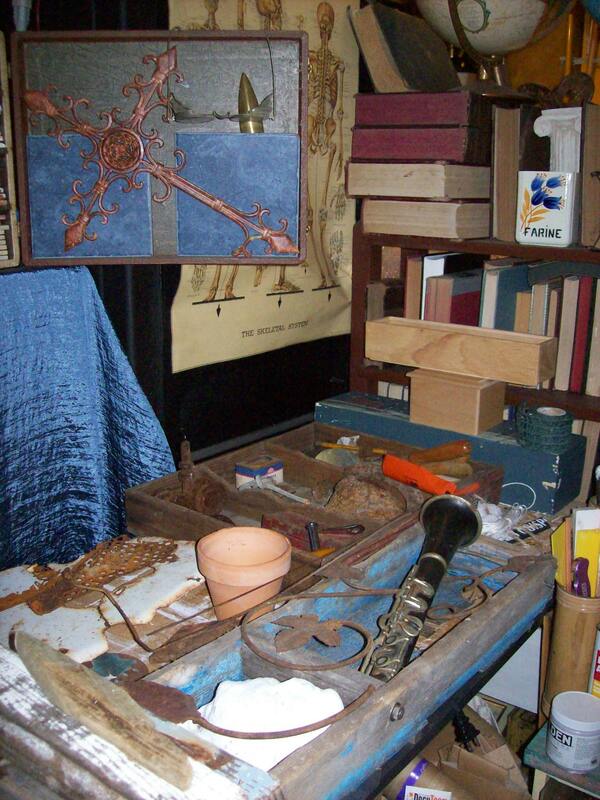 In my studio I am a dreamer and an alchemist. In my studio I am a dreamer and an alchemist. I take the found detritus of the street, the shore and the second hand. 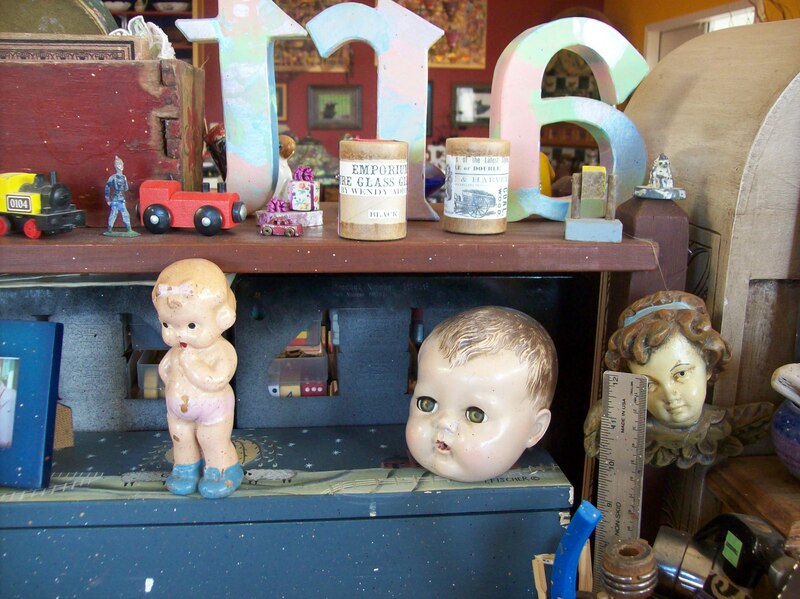 I collect the rusty, the worn, the tattered and torn. It sits on my art table and marinates – sometimes for days, sometimes for months, until the dream takes shape. I mix in canvas, paint, pastels, cheesecloth, paper – and all is transformed into mixed media collage and assemblage. Working with these materials, I have developed a fine sense of history and an empathy for the people who first used and touched the items. This has been especially poignant for me the last several months as I have worked on “The Pity of War” a solo show for the Allied Arts Gallery in Cambria. The collages and altered books in this exhibit focus on the two world wars; the WWI poets , the Holocaust , and the bravery and resiliency of civilian populations. To contact or to learn more about Erin, visit her website or her blog. 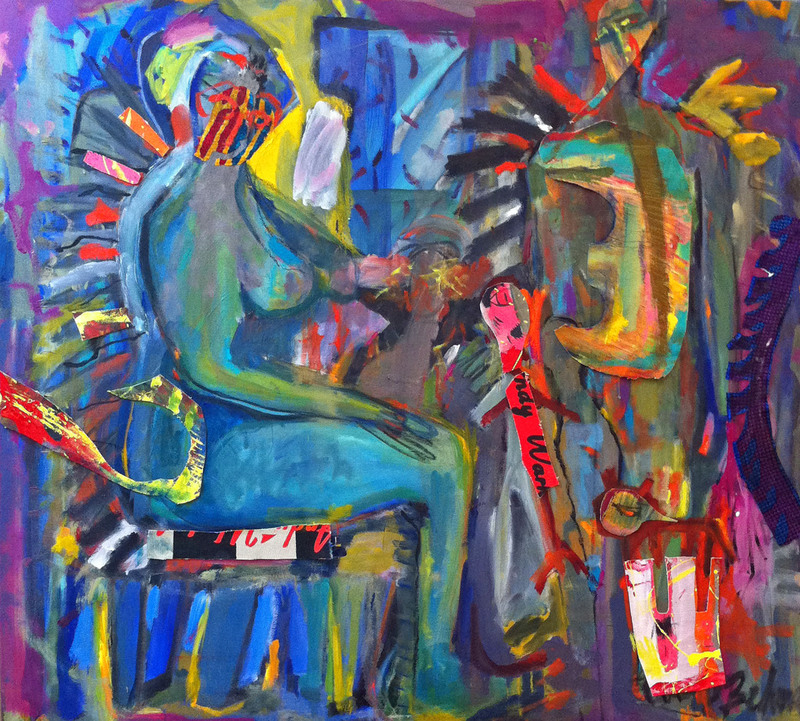 As Open Studios is still 9 months away, most of the artists on the 2011 Tour are focusing on other projects. 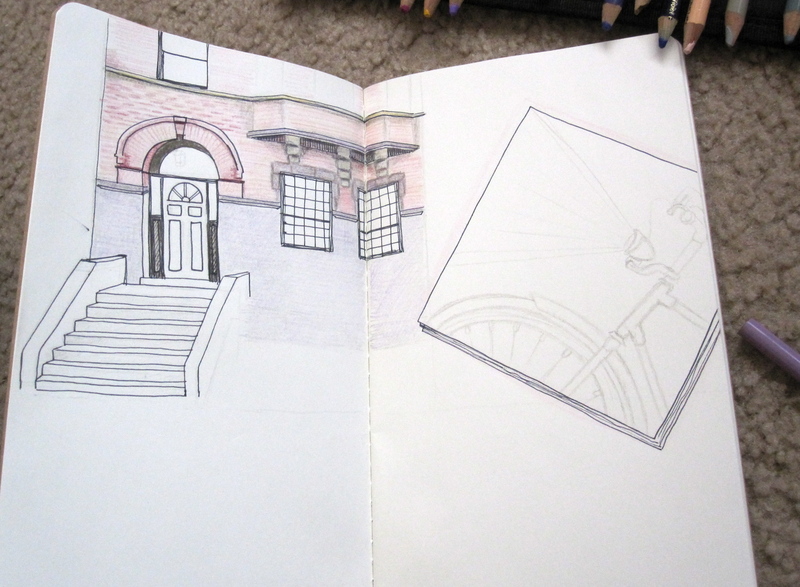 Ohio-born artist, Jenna Hartzell, has recently finished her first sketchbook for Brooklyn-based Art House Co-op’s 2011 Sketchbook Tour: “it’s like a concert tour, but with sketchbooks.” In this post she shares with us her 1st and 2nd page, before & after. 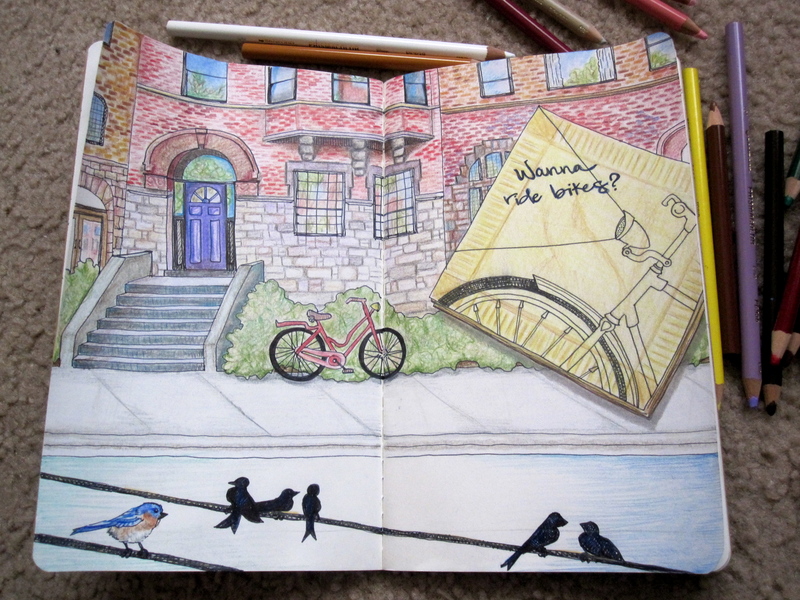 Hartzell describes her pages as “East meets SLO” telling us she loves the look of New York Brownstones, and since the Sketchbook Tour begins in New York, she wanted to represent NY at the beginning. SLO is represented with the bike, as bike riding is so much a part of SLO culture. Hartzell’s intent was to “invite the viewer to take a journey” through her sketchbook.” Each participant of the Sketchbook Tour is given a theme to serve as inspiration; Jenna’s theme was “things found on restaurant napkins.” To see more of Jenna’s artwork visit her blog. To learn more abut the Sketchbook Tour click here.